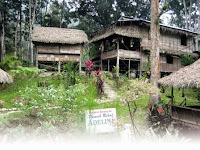 We have made a booking for 30 persons at Rumah Rehat Adeline on the 21st and 22nd July 2007. We have make arrangement to gather at Gopeng toll Exit at 10 am. There are 12 of us from Kajang, 12 from Klang and 6 from Setiawan. We proceeded to Gopeng town to have breakfast for those who missed their breakfast while waiting for the Setiawan group to join us. Finally when everyone assembled we convoy into Adeline Rumah Rehat which is 6KM away from the town. The road leading to the Rumah Rehat is narrow and winding and you have to keep blasting the horn at blind corners to warn oncoming cars. When we arrived at Rumah Rehat we were shown to our sleeping areas. The main (first) building with two big rooms which can accommodate 10 person each. Adeline has prepared 6 extra tents for us for those who wants to enjoy nature at ground level. Some occupied another 4 rooms at the north side. It is durian season and our trip includes 4 meals (1 lunch, 1 tea break, 1 dinner and 1 breakfast), it also includes durian, rambutan and mangosteen on the house for RM$102.00 per person. 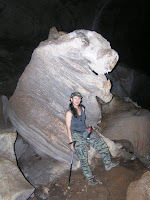 Cave Kandu with slopes and tunnels and KC posing with a LION Head rock formation. Our lunch is at 12.30 and while waiting for our lunch we went around looking for durians. We managed to collect a few and ate them right away. 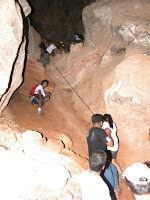 After lunch only 16 of us registered for Gua Kandu (Cave Kandu - additional RM$30.00). Cave Kandu was once occupied by the communist just after the WW II and till today you can see communist poem being written in Mandarin and vandalized by visitors. We boarded a lorry to ferry us to Cave Kandu and riding at the back is first experience for many of us. 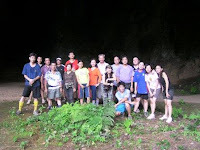 Our caving started at 2pm and ended at 4pm. This cave which was once occupied by the communist and there are many chambers and tunnels which would require a full day tour if you wish to visit all of them but only for the physically fit. Therefore you need an experienced guide to take you around. The Guide instead of the normal en try and he took us the back way. The 'stick insect' which we found in Broga (posted in YouTube) was also found here. It look exactly like a twig when it lies still. We were told this insect can be found in many places and its difficult to see them because they looked like twigs. It is a 100m steep climb and the reason why he took this route because if we were to exit this way it would be very steep and slippery after the rain. After caving we were brought back to Rumah Rehat Adeline to have our tea break. We have 'teh tarik' and 'kuih udang' (prawn fritter). Later we assembled the rest of them for the next event, waterfall and body rafting. Instead of making 2 trips to the waterfall, all of us were squeeze into the lorry. Other then the famous 'white water rafting' which cost RM150 per person, the body rafting is free of charge but must have cou rage for the first attempt. Only 8 of them tried the body rafting. To body raft safely, you must lie flat with both hands loosely spread out for guiding, do not sit up or you will have sore bums, don't stand up while floating down and finally relax for a exhilarating ride down. The first time most of us will gulp some of the water and after that you will be more experience. The rest will enjoy the cool water either wading or swimming around the area. 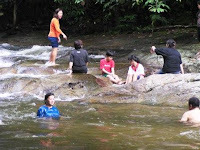 Later back at Rumah Rehat we took bath and the water feels icy. Dinner is at 7pm and durian party at 9pm. After dinner we didn't wait and started to have our durian at 8.30pm even though we were still full after the heavy dinner. KC opened almost 65 durian fruits and most us of have no problem eating them, greediness knows no bound. We have tea 'O' after eating durian. Later some of them who have been friends for 30 years chit c hatted till 2am and their children played card games till 3am in the morning. Morning breakfast is at 8am and after breakfast is free and easy. Some prefer to skip breakfast and sleep till 11am. Many commented that in Rumah Rehat Adeline one has no chance to get hungry and there are plenty of good food cooked personally by Adeline. We left Rumah Rehat at around 11.00 am and our next itinerary was to have lunch at the famous "Yong Wai" Roasted duck and also to buy "Heong Pang" (a local biscuit delicacy) a few shops away from the restaurant. 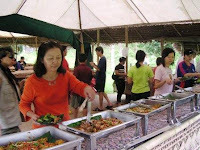 After our heavy lunch we went to visit "Kek Lok Tong" Temple Cave. We spent almost 1 hour there enjoying the cool breeze and decided to abandon our seafood trip at "Tualang" because of too much eating. Before we left Ipoh we went to have their famous coffee at one of the food courts. It started raining and some of us convoy using the old trunk road to avoid paying toll (save RM$20.00) by going back into the highway through Rawang. Body Rafting down a small rapid. Congratulations you made the top 20, has traffic increased after the announcement? Thank you, it was unexpected as I started this blog only a few months ago. 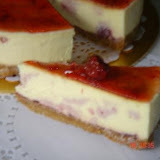 By the way I am impressed with your blog, lots of photos and videos. very nice and interesting hobby u have. very adventurous and blogged it to the world to share. Thanks sri kebakat when I saw your blog it reminded me of Nasi Kerabu in Kelantan.